Hot on the heels of Mosaic Promise, Founders love affair with "single-hop" IPA now steps into the juicy and tropical world that Azacca hops provide. The firm amber-stained ale is bright and bold, casting a froth aromatic ecru foam stance with juicy pineapple, red grapefruit, mango, apricot and melon. To taste, its rich caramel, pecan and toasted sweetness is steadfast and moderately rich. With the middle palate opening to the hops, its malt presence relaxes slightly but remains caramel-rich with hints of cracker-jacks candy. And the wafts of ripe fruit begin with a bold citrus tone of grapefruit, orange and lemon and then quickly turn to canteloupe, mango, pineapple and then a bright herbal bitterness that's remiss of chive and fresh-cut grass. Siding as much with amber ale as of IPA, the medium-bodied ale retains a caramel and malty taste and texture to support the strong bitterness in finish. Drying but not absolute, the beer's closing arguments are sharp of citrus peel, grass and peppercorn with an aftertaste of candied citrus. 12 oz bottle poured into a Founders shaker pint. Gold with 1+ fingers of creamy off-white head with good retention. Excellent clarity with medium-light carbonation. Peach rings, candy sugar, dank, wintergreen, and honey. Notes of peach rings mixed with papaya rind, earth, and soap. Light malt bill consisting of biscuit, honey, and slight candy sugar. The hops finish spicy and grassy. Lingering notes of crushed Aspirin follow. Medium bodied, oily, semi-silky, dry, and bitter. Has subtle Mosaic hop qualities blended with spice, grass, Aspirin, and earth. Azacca is a strange hop. Pours a very clear dark orange with a white head. Smells of hops, citrus, fruits, and malt. Tastes of caramel, sweet malt, citrus zest, slight tropical fruits, and pine. Medium in both body and carbonation. Overall a pretty good IPA. Served on-tap in a Shaker pint at Beer Run (Charlottesville, VA). A: Orange-amber hue with 1/2 finger of off-white head with decent retention and a few rings of lacing follow. S: Juicy tropical fruit with pineapple, guava, and mango mix with melon and herbal floral notes as well. Reasonably healthy malt presence, medium caramel along with crackery character. No yeast or alcohol presence. T: Flavor is very fruity hoppy with pineapple, orange, and heavy lime along with honeydew melon and a floral finish. Frankly not bitter enough as the caramel sweetness is a bit much but not overbearing but leaves a candied impression of all the hop flavors, begging for more bittering. No alcohol or yeast character. M: Despite the sweetness, it finishes fairly dry with light-medium body and moderate carbonation. O: Ratchet up the bittering by about 10 IBUs or take the caramel malts down a notch to ditch the candied fruit character and I think this would be a big winner. Deep, rich red gold color with white cap and good lacing. Aroma of bright citrusy hops under girded by caramel malt. Taste on entry is hop forward with a burst of citrus that elevates the brew well above the heavy handed hopping sometimes found in IPAs. There is a brightness in the hopping that's quickly joined by a restrained caramel sweetness as if the two were melded in a symbiotic fashion at birth. There's complexity here with all the parts distinct yet fully integrated into a whole. Great balance all the way with lingering hop bitterness in the aftertaste that lasts not in a harsh way but shining brightly like a lamp in the darkness. Medium-full texture with balancing carbonation. This is a distinguished brew with great polish. Sometimes when I see a new to me IPA I reflexively think another ho-hum, but this one is an eye opener that awakes the senses and gives joy to the palate. On tap. White head. Golden orange color. Very juicy IPA. Massive orange juice and tangerine. Some grapefruit. Tons of citrus. Light bready malts, but overall it is extremely hop forward. Very drinkable and enjoyable. This is a winner. Picked up a 12 oz. single because Founders. One of the few breweries that deserves the benefit of the doubt every time, because they’ve earned it. So back to the Mango Magnifico re-make! The pour is a warm orange, filtered. The nose is a delicate cornucopia of tropical fruits; I feel like inhaling too hard would make it disappear. Bubblegum & Orange Crush with a cola sweetness round things out. Nice & nicely different. Azacca carries the Orange Crush motif a bit too far. Sweet candied oranges & wild honeysuckle up front combine with slight over carbonation to bring me right back to 1978. Mild bitterness dances in stage left, & there’s herbal herbiness, cucumber, grapefruit, & mild tartness. The finish is beaver-wood dry. I will get through this entire bottle. I’m unsure if it’s the hop or the beer itself, but this one just doesn’t hang together well for me. Not bad, but nothing I would seek out again. Decent enough. Bottle date reads 12/09/15. Poured aggressively into a Stella goblet. Pours a man amber honey color, with off while frothy head that hangs around for a while. Beautiful lacing is present as I continue to sip. Great head retention! Smells of rye berries, earthy hops, green apple, acetaldehyde. Interesting nose. Tastes very dry and earthy. As one of my guests once said to me, "this beer tastes like dirt." Thank you anonymous guest for that quote. I'm apologize for never catching your name. Awesome mouthfeel going on. It feels like the sweetness of the malt and the dryness of the hops are going to war in your mouth. Eventually the mouth has a dry feeling but sweetness and bitterness when licking the lips. Overall s pretty interesting beer. I figured this would rate low because most newer craft beer drinkers are familiar with two types of IPA styles. This is definitely different than a west coast citrusy IPA (stone enjoy by, ballast point sculpin) and an east coast floral/malty IPA (victory hop devil, bell's two hearted). I feel that for what it is, it is delicious and done right. Drink this one fresh. Bottled on 12/14/15.Pours into a standard pint a deep burnt orange with a very well defined extra sticky ever so slight off white head atop.An appetizing mix of juicy tangerine and sharp grapefruit-like hops standing out in the nose,very juicy and fruity.Slightly sharp and mildly "fizzy" in the mouth but as far as body goes it's where it should be for the style.Bright tangerine flavors with underlying and lingering grapefruit over top of a slightly sweet biscuit malt base.Another damn fine beer from the guys in GR,keep the single hop beers coming. Pours a cloudy dark amber with a 2 finger foamy off-white head. Lacing traces all over the glass. Smell is orange with slight mango. Taste is orange with burnt malt. Very slight tropical fruit notes. Bitterness is pretty harsh and overpowers the tropical flavors of the hops. Mouthfeel is slightly thicker than normal. High carbonation which leads to a higher perceived bitterness. Overall, pretty disappointed by this one. It's just way too malty and harsh. None of the things that make Azacca stand out are here. I get a little mango here. Not a lot of bitter. Pretty well balanced. It is good and the 7% will sneak up on you. You can easily down a sizer of this and not have your palate burned out. 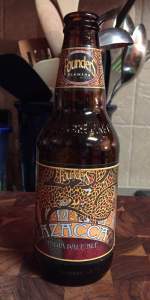 Interesting brew, I would not seek it out again, but I am happily drinking it. A: 2.5cm head of off-white colour. Decent thickness and frothiness. Retention is nice - about 4-5 minutes. Leaves light lacing as it recedes. Body is a clear vibrant copper. Clean, with no visible yeast particulate or hop sediment. Looks nice for an IPA. Not unique or special looking. Sm: Pale malts and a balanced hop profile. Floral notes, vague fruit, faint grass, new world mango hop character. Suggests a balanced enjoyable brew with a pleasing albeit conventional hop profile. I detect no off-notes, booze, or yeast. T: Pale malt sweetness. Hop profile is mild and reticent, actually. The usual floral notes, plus assertive hop bitterness with hints of pine and rindy bitterness. Somewhat herbal. It's a contained, reticent, slightly shallow IPA. Fine, but not unique, special, or a paragon of this over saturated style. I like it for what it is, and I find no off-notes, booze, or alcohol. Mf: Medium-bodied. Slightly overcarbonated. Smooth, wet, crisp. Not oily, gushed, hot, boozy, astringent, harsh, rough, or scratchy. O: Drinkable and pleasant enough, but it won't impress fans of the style. Founders continues to have trouble turning out a truly impressive IPA. I wouldn't recommend it to friends. Medium copper color with an off white head which is quite frothy and lasts awhile. Aroma is more malty than anything else, bready biscuity notes, with a slight berry aroma. Hops are missing in the aroma a bit, I haven't had Azacca hops yet and was hoping to get more from the aroma. The hops are far more present in the taste, high bitterness levels dominate. Toasted malt cuts through the bitterness a bit, but there isn't much sweetness. Medium-full mouthfeel with medium levels of carbonation. Finishes quite dry with bitterness lasting well into the aftertaste. Dark bronze with modest white head and thick lacing. Sweet aroma of tropical hops and malt. Tropical taste up front gives way to distinctive spicy, herbal taste. Average body for the syle. Worth a try, but as a single hop, Azacca apparently isn't what I'm looking for. Poured from the bottle into a Spiegelau IPA glass. Bottled 12/14/2015. Classic clarity and nearly looking perfect. Deep orange amber body, shimmering and clear, not quite crystal but with plentiful carbonation rising through the glass. It meets a classic thick rich off white head, rocking and three fingers tall with pill scattered lacing. Head bubbles manage to be a bit soapy looking as opposed to fine. Excellent looking brew. Interesting hop angle. Subtle tropical notes with an airy quality. Malt has some soft chewy quality, faint toast but a nice sweet honeyed cararmel that isn't too large either. An interesting little bit of dank quality gets in as well. Palate manages to keep things simple. Mildly juicy but also a bit grainy in the mid palate. Slight hints of lightly tropical mango but a bit watery backbone supporting it on the hop angle. Excellent lingering hop oils in a bit of pine and mild astringency for the aftertaste. Controlled and fun palate with an almost peppery sweetness mixing in to pull out the caramel like notes which are small. Interesting hop, good usage in the beer but not really grabbing me with that much excitement. Decent solid brew. A- Pours a darker burnt orange, red with a moderate head that dies down fairly quickly. S- Orange peel, zest, stone fruits. T- Has more hop bite than the nose would suggest, but it works flawlessly with this azacca hop variety. Tastes like a liquid version of an orange and zest. Very good! M- Medium carbonation and slightly drying. D- A unique APA and one that I will.definitely buy more of! 12oz bottle that I poured in order to get a 2inch head. Look is copper orange, good retention and nice lacing. Smells grapefruit, mango and peach. Quite a bit of citrus on the nose. Taste, hints of tangerine and orange hidden in the grapefruit strong flavor. Feel, light carbonation, fairly quaffable. I only have one for the evening so I will instead sip on it for a bit. Overall: I was excited before even buying it, I mean it's Founders. And this lives up to the hype - at least that of the brewery. 12oz bottle from Hop City (Atlanta, GA). 1.79. Bottled 12/14/15. Served in a Founders snifter. Pours a clear burnt orange with two fingers of pale head. Nice retention with a full thin sheet of bubbles that linger across the surface and a fluffy halo that leaves copious lacing. Smells slightly tropical with pineapple, mango, berries and a little caramel. Flavors are softly tropical and moderately bitter. Faint piney mango, bitter pineapple flesh, berry seeds, floral root and an underlying, mild caramel sweetness. Semi oily, medium body with plenty of carbonation. Lingering, bitter aftertaste of tropical fruit skins and faint caramel malts. It's good to see Founders shaking up their lineup with a new IPA. Azacca hops provide a nice fruity nose and moderately bitter, fruit tinged flavor profile. It may not cater to my tastes enough to be a mainstay for me but this is some solid stuff. This beer pours a luminous amber with a moderate head and good lacing. The aroma leads with and blast of orange and grapefruit, followed by mango, pineapple, and, oddly, cucumber. The flavor leads with a good deal of citrus and mango, and a great woodsy bitterness at the finish. The mouthfeel is not to thick, which is nice given the rich flavor. Overall this is a complex and enjoyable IPA, giving a solid showcase of this hop.